Dhaulagiri French pass trek is one of the challenging trekking destinations of Nepal. The Nepali name is Dhaulagiri. The name comes from Sanskrit. DHAWALA means incredible, white, and delightful and Giri says the chain of mountains. So in exact translation in Nepali is the white mountains. 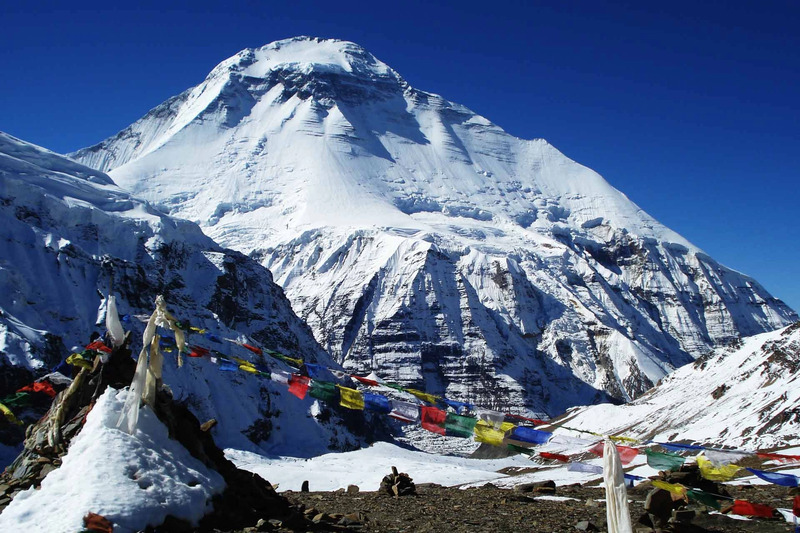 The altitude of Dhaulagiri is 8,167 meters and the 7th highest peak in the world. 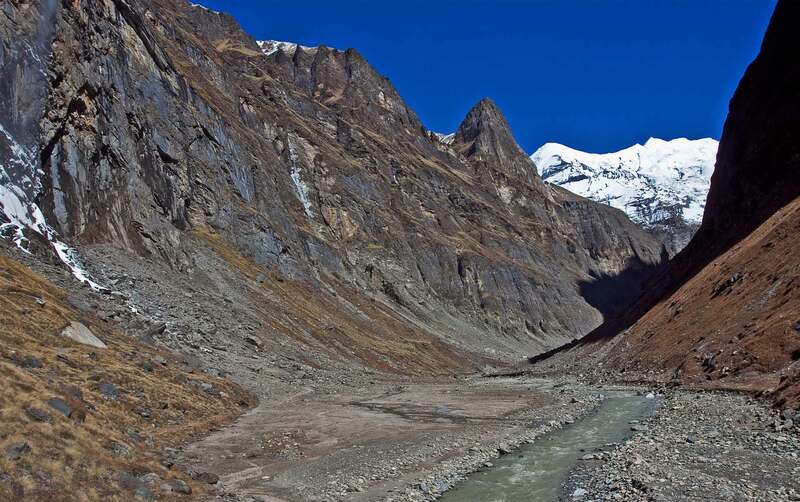 The Dhaulagiri massif thus extends from the Kali Gandaki River west to Bheri. Although the Dhaulagiri circuit trek via French pass is severe, giving you a thrilling experience. But the wilderness features of Dhaulagiri present adventurous trekking into the trans-Himalaya of Nepal. While wandering along the zigzag trail next glaciers and traverse high snowy passes can be difficult. But it offers a challenge wishing to take lifetime adventures. The Dhaulagiri French pass trek begins from Beni then passing through the remote villages and delightful passages along the Rahu River en route Dhorpatan Hunting Reserve. The trail leads us too dense forests and pasture to Italian Basecamp. 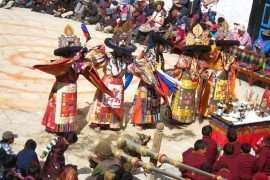 It offers the alpine yak pasture whereas a fascinating glimpse of Mount Dhaulagiri. Thіѕ trek is one of the challenging treks in Nepal although the trail allows discovering the green lush terraced hillsides and typical villages. Once getting the glacier then it leads to Dhaulagiri Basecamp. Besides, climb up to the French pass with a height of 5360 meters to enter the hidden valley passing through the French pass. It allows exploration of superb mountain views heading to cross the Thapa pass (5250m) where to appear magnificent view of Annapurna 1. But, the physical condition and technical knowledge need making Dhaulagiri circuit trek. 3: Fly Pokhara (45 Min. ), drive Beni (3h00), Trek Tatopani (900m) 3h00 walk. 4: Trek to Dharapani (1560 m) 6h00 walk. 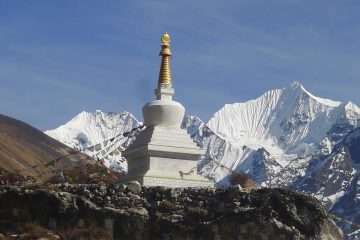 5: Trek to Muri (1700 m) 4h00 walk. 6: Trek to Baghara (2375 m) 6h30 walk. 7: Trek to Dobang (2600 m) 6h15 walk. 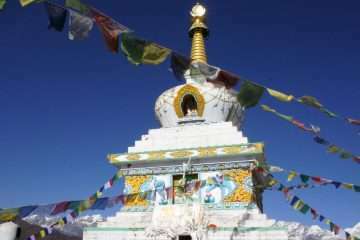 8: Trek to Chatare/ Bhainsi Kharka (3000 m) 5h00 walk. 9: Trek to Japanese Camp (3850 m) 5h45 walk. 11: Trek to Dhaulagiri Base camp (4750 m) 7 – 8h00 walk. 13: Base Camp – French Pass (5360 m) – Hidden Valley (4900 m) 7h00 walk. 15: Hidden Valley – Dhampus Pass (5250 m) – Yak Kharka (4920 m) 7h00 walk. 16: Yak Kharka – Jomsom (2800 m) 6h00 walk. Day 3: Fly Pokhara (45 Min. ), drive Beni (3h00), Trek Tatopani (900m) 3h00 walk. We will have breakfast at the hotel, followed by transfer to the domestic terminal to get a flight to Pokhara. 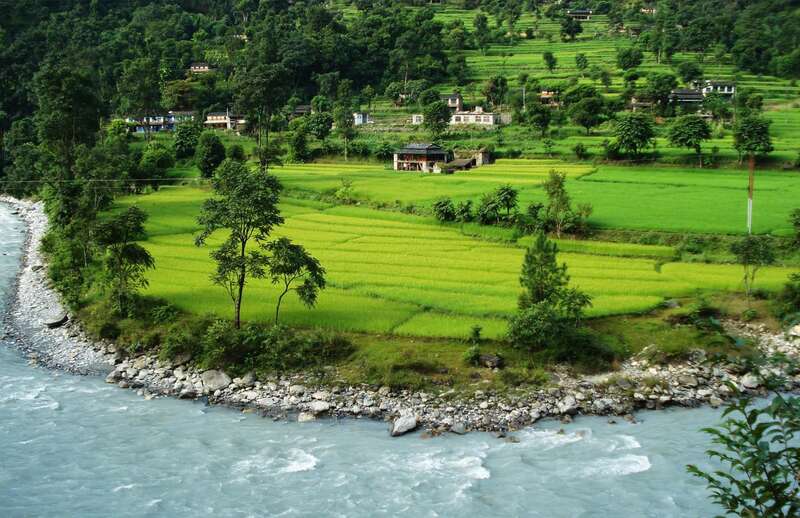 Then, pack off all the backpack and 3 hours drive to Beni road through the Annapurna Foothill. Then, 3 hours walk to Tatopani along the bank of Myagdi Khola. Day 4: Trek to Dharapani (1560 m) 6h00 walk. The trail leads you Dharapani along the bank of Myagdi Khola. There might be a disturbance in the path in several places during the monsoon season due to landslides that leads several ups and downs. The trail goes passing by several settlements along the trail to Dharapani. Day 5: Trek to Muri (1700 m) 4h00 walk. Day 6: Trek to Baghara (2375 m) 6h00 walk. 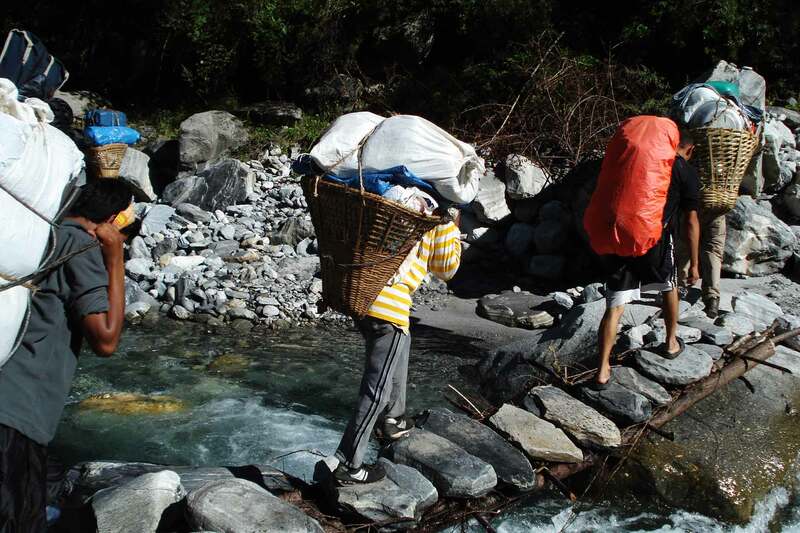 Initially, starts trek descends with a bridge of Dhola Khola. Then, across it, the pretty trail downs through the cultivated land, rice fields and isolated villages and gradually, climb up to get the village of Naura which is larger settlements of Baghar. Day 7: Trek to Dobang (2600 m) 6h00 walk. Initially, the trail goes down to Jyardan, this is the last village of the valley and another village we will meet until we arrive at Marpha. The trail goes gradually climbs up passing through the forest as we find some shepherd huts in some place. It called Kharka where cattle graze the grass. Finally, we arrive at Bobang. It is also Kharka. Day 8: Trek to Chatare/ Bhainsi Kharka (3000 m) 5h00 walk. Once again, we enter the forest area after crossing Konban Khola, climb to the top where we can see the west wall of Dhaulagiri I and descend to Myadgi Khola, cross it takes a path to the east bank of the river to get a summer grazing camp, Bhaisikharka. Day 9: Trek to Japanese Camp (3850 m) 6h00 walk. The trail leads forested area well known as Italian Base Camp in the rocky area, passing a steep slope and ascending to cross moraine of Glacier which falls from Dhaulagiri. Continue to walk along glacier encounter a spectacular grassy campsite called Japanese Camp. Day 11: Trek to Dhaulagiri Base camp (4750 m) 7 – 8h00 walk. Today early start up the trek due to a long day walks in the mountain through the glacier. Finally, we reach Dhaulagiri Base Camp. From the Base Camp, I can See the majestic view of Dhaulagiri I, II, III and IV and an amazing view of Icefall in front of Campsite which falling from the pass between Dhaulagiri and Tukuche Peak. Today is the second day of Acclimatization, before crossing the pass of Hidden Valley. There is an opportunity to walk around for good views. Day 13: Base Camp – French Pass (5360 m) – Hidden Valley (4900 m) 7h00 walk. 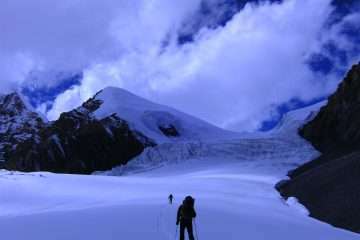 We will continue our adventure journey along the Chhondarban Glacier on the north side and continue climbs the stairs above the glacier with zigzag trails across the moraine of the glacier to the easy snow slope which leads up to French Pass (5360 m). We can see 360° stunning mountains range the pretty descend across the easy snow slope that takes us to the Hidden Valley. This is considered as a spare day in case of any problems that affect our schedule. If it is not required, the day can be used for exploration valley. Day 15: Hidden Valley – Dhampus Pass (5250 m) – Yak Kharka (4920 m) 7h00 walk. Today, we climb another adventure Dhampus pass with an altitude of 5250 m. lesser than French Pass which overlooks the deep gorge of Kali Gandaki Valley and Annapurna range. A steep and rocky descend to Yak Kharka. Day 16: Yak Kharka – Jomsom (2800 m) 6h00 walk. Early morning take a short and exciting domestic flight to Pokhara. Rest of the day at leisure and have a chance to explore the lake and city. In the morning, we transfer to the airport and board the flight back to Kathmandu. Reminders of the day at leisure. DEPARTURE TIME Please enter at least 2 hours before the flight. Prices are quoted in (US$ dollars) and payable in any convertible currency. All prices published on our website are set as low as possible. The Prices may vary at any time due to currency fluctuation, fuel prices, and unforeseen economic circumstances. But, we guarantee our prices which already signed up for your tour. Please consult us for a custom quote.